PAUL BILODEAU/Staff photoMayor Sefatia Romeo Theken gives Gov. 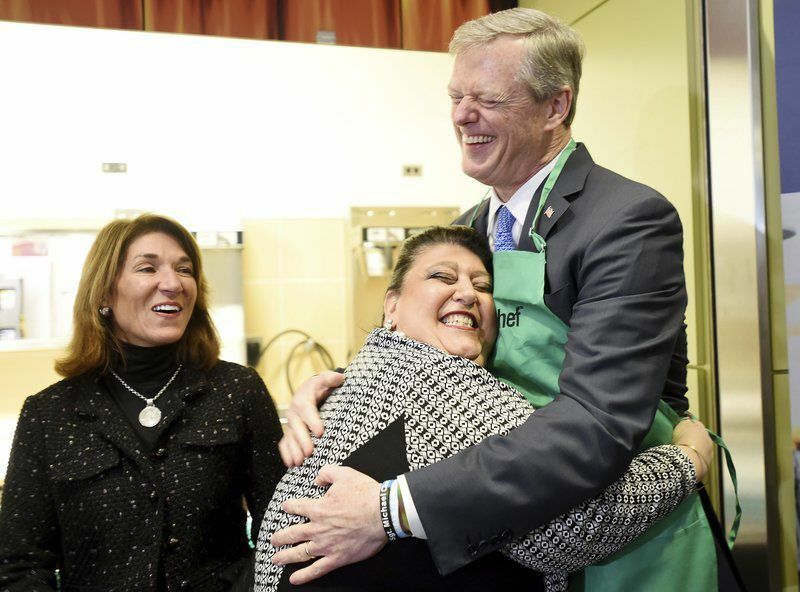 Charlie Baker a hug after giving him his cooking apron while Lt. Gov Karyn Polito looks on during a press conference promoting Gloucester seafood during the Seafood Expo North America and Seafood Processing North America at the Boston Convention and Exhibition Center in Boston on Monday. PAUL BILODEAU/Staff photosMonte Rome of Intershell, right, talks with a client while Mike Orlando, in red, Intershell sales manager, speaks with a buyer in the background during Seafood Expo North America and Seafood Processing North America at Boston Convention and Exhibition Center in Boston on Monday. Mayor Sefatia Romeo Theken is interviewed by the Chinese media during Seafood Expo North America and Seafood Processing North America. PAUL BILODEAU/Staff photoU.S. Rep. Seth Moulton, D- Salem, gestures as talks during a press conference promoting Gloucester seafood during the Seafood Expo North America and Seafood Processing North America at the Boston Convention and Exhibition Center Monday. A dozen rows to the south, along a stretch of the teeming exhibition space called Massachusetts Avenue, more than a half-dozen Massachusetts seafood companies — including Gloucester’s Intershell International, North Atlantic/Pacific Seafoods and Cape Seafoods -- plied their trade. Mike Orlando of Intershell, who also serves on the city Fisheries Commission, said his guys filled two major orders on Sunday that were shipped Monday. One went to New York. The other went to Houston. Both were heavy on shellfish. “That was really big because historically we haven’t done a lot in Texas,” Orlando said while standing behind Intershell’s exhaustive spread of fresh seafood products that included shellfish, fin fish, lobsters and scallops. “If it comes out of the Gulf of Maine, it’s on this table,” said Frankie Ragusa of Intershell. 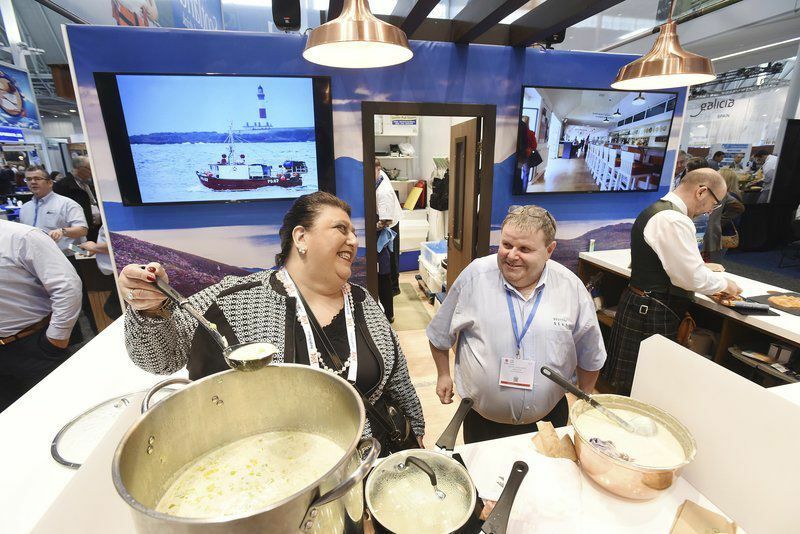 The two Gloucester guys were asked what percentage of first-time sales at vast seafood shows such as the Seafood Expo North America end up being regular customers. Down the row, Gerry O’Neill of Cape Seafoods also reported brisk trade on herring and mackerel and plenty of discussion about the state of bait in 2019 in the wake of significant quota cuts to herring. Those are the kinds of testimonials city officials want to hear. It’s been five years since Gloucester returned to the seafood show as the only Massachusetts coastal municipality with its own booth. While there is no debate that Gloucester’s presence has elevated its visibility nd the Gloucester Fresh brand, it’s been more difficult to quantify the exact financial return from the city’s investment. It’s also due to the progressive nature of building a brand. It just doesn’t happen overnight. It requires time and an organic approach. It requires relationships. It requires being where you need to be if you really want to do business. That point was driven home with even more force at the invitation-only reception that drew Gov. Charlie Baker, Lt. Gov. Karyn Polito, U.S. Rep. — and possible presidential candidate — Seth Moulton, state Senate Minority Leader Bruce Tarr, Mayor Sefatia Romeo Theken and enough city officials and volunteers to fill an ark. And of course, the city’s best seafood friends — the Scots. The use of the kitchen and the special reception room above the exhibition floor came at the largesse of David Gibbons, who runs the Boston Convention and Exhibition Center and who apparently has fallen under the Gloucester spell. “Nobody leverages what happens in this building better than Gloucester,” Gibbons said. And on it went, with Moulton, Polito, Tarr and a somewhat subdued Baker all praising the city’s resolve in attacking head on the problems and challenges of a fishing community trying to survive a shifting seascape.